The conjoined Bhutanese twins, Nima and Dawa Pelden, have been successfully separated by surgeons at the Royal Children’s Hospital (RCH) in Melbourne, Australia today. The 15-month-old twins had been joined at the torso and shared a liver. The surgery took a team of 25 people about six hours to complete. The twins are now recovering from the surgery. 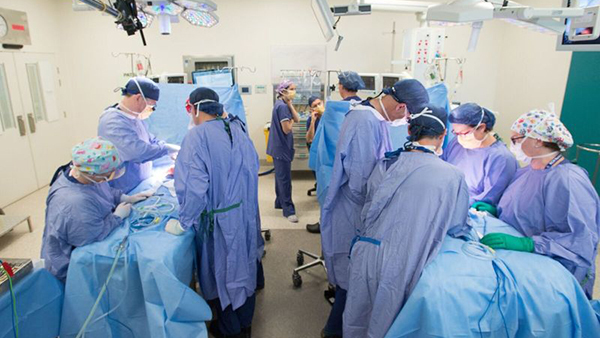 The Lead surgeon Doctor Joe Crameri told the local news reporters in Melbourne that they did not find any surprises as they knew the liver would be connected which they divided successfully. Doctor Crameri said the best part of the surgery was that there were no highs and lows and that it was all very calm. He also added the girls are expected to be in the hospital for at least a week. The life-changing surgery for the twins was initially planned in October. It was later postponed after the twins were found to be low on vital nutrients and vitamins. Since then the clinical nutrition unit of RCH worked to improve the twins’ health in time for the surgery. The surgery of the twins was carried out after the girls were found healthy enough to go through the separation surgery. The Victorian government offered to pay for the procedure and recovery. The cost of the flights and accommodation was covered by the Children First Foundation, an Australian-based charity. The girls along with their mother flew to Melbourne, Australia last month.